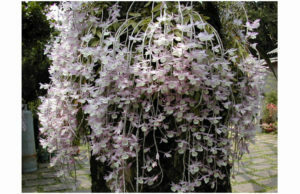 Dendrobium Garden » Dendrobium aphyllum (Roxb.)C.E. 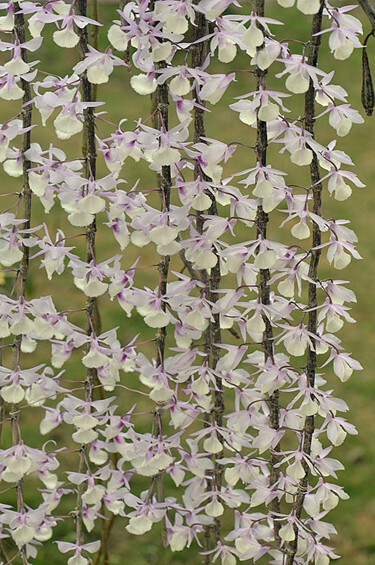 browse:Home Dendrobium Dendrobium aphyllum (Roxb.)C.E. 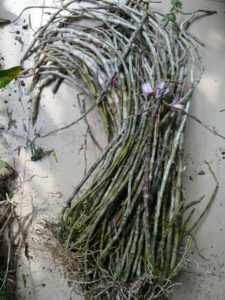 Scientific Name: Dendrobiumaphyllum (Roxb.) C.E. Origin: India, Sri Lanka, Indochina Peninsula to provinces in southern China and Hainan Island, Indonesia and other places. China is located in the northwest of Guangxi (Longlin, Xilin, Dongye), southwestern Guizhou (Xingyi), southeast Yunnan to western (Funing, Jianshui, Jinping, Mengla, Menghai, Lushui) and other places. This species is very wide distribution, color and flower size often change. Distribution: Taiwan is suitable for cultivation around the north and south. Uses: planted in the snake wood board or attached to the cultivation of fine ornamental plants. Stems: Stems sag, succulent, finely cylindrical, 30-60 (-90) cm long, 0.4-0.7 (-1) cm thick, unbranched, with many nodes; internodes 2 to 3.5 cm long. Leaves: leaf paper, two rows alternate in the entire stem, lanceolate or ovate-lanceolate, 6 to 8 cm long, 2 to 3 cm wide, apex acuminate, base sheath; leaf sheath paper, dry Shallow white, sheath mouth was cup-shaped open. Flowers: racemose almost inflorescence axis, every 1 to 3 flowers for a bunch, from the leaves or leaves with old stems issued; inflorescence stalk length of about 0.2 to 0.5 cm, the base is 3 to 4 sheaths; Culms membranous, ca. 0.2-0.3 cm. Bracts pale white, membranous, ovate, ca. 0.3 cm, apex acute; pedicels and ovaries dark brown greenish, 2 to 2.5 cm long; flowers spreading, drooping; sepals And petals white with pale pink or pale pink or sometimes all pale pink; middle sepals nearly lanceolate, 2.3 cm long, 0.5-0.6 cm wide, apex acute, with 5 veins; sepals similar to Sepals and other large, apex acute, with 5 veins, base askew; Calyx capsule narrowly conical, about 0.5 cm, blunt end; petal oval, length 2.3 cm, width 0.9 to 1 cm, apex obtuse, entire , With 5 veins; labellum broadly obovate or nearly round, long, 2.5 cm wide, surrounded by pistils on both sides of the formation of a trumpet-like flanks, both sides of the base with purple stripes and narrow for the short claw admission, above the central Part of the light yellow, part of the following light pink central edge with irregular serrated teeth, densely pubescent on both sides; Rui Columns white, dense minipigs protruding hair, the front edge of the wide-concave. Flowering from March to April. Fruit: Capsule narrow obovate, about 4 cm, thick 1.2 cm, with a length of about 1 to 1.5 cm handle. Fruit 6 to 7 months. Features: Dendrobium orchid Dendrobium orchid deciduous perennial herb. With the nature of the cling to the root growth of air tree growth, ptosis drooping. Leaves smooth, winter leaves sleep. Spring stems at the festival last year blooming, each flower 1 to 3 flowers. Petals pink, lip-creamy tomentose, lip half-rimmed or tassel-serrulate. 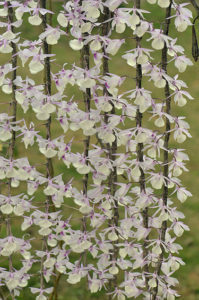 Due to easy cultivation and flowering is good, as one of the increasingly popular Dendrobium. Dendrobium orchid can be divided into two major categories: Dendrobium and autumn Dendrobium: Dendrobium deciduous, spring flowering, blooming in both sides of the stem, flowers and more dense; autumn autumn flowering Dendrobium, blooming in the top of the stem, Ecology resembles Phalaenopsis. Dendrobium born strong, strong reproductive, easy to cultivate, prosperous blossoming, rich colors, often beginner cultivator favorite object, and very adapt to Taiwan’s terroir climate, especially in southern Taiwan close to the tropics, more suitable for its growth.